President Trump and Chief Justice Roberts have recently had a much publicized feud about judicial activism by judges in the Federal Court System and the Supreme Court. It is the opinion of Chief Justice Roberts that the Federal Court System including SCOTUS is apolitical and that decisions are based on constitutional law and not on the political beliefs and agenda of the judges. After viewing the senate confirmation process for Supreme Court justices in recent years, it is very difficult to agree with Roberts. Senators, their advisors, and research staff spend hours reading previous judicial opinions, speeches, and both public and private statements of the nominees. Then, before the hearings have taken place, they announce to the media their probable vote based on the nominee’s support of the senator’s political agenda. The nominee’s education, years of experience, honors, commendations, and the opinions of his or her peers seems to be of little importance. A knowledge of history is important. Bob Levy’s book, The Dirty Dozen, outlines the twelve worst Supreme Court decisions, each of which clearly demonstrate the political bias of the justices as well as the flagrant blackmail of the Supreme Court by politicians to advance their agenda. It is clear in Levy’s book from the perspective of history and by numerous federal court decisions in our time that the federal judiciary is not infallible. In fact, many decisions directly contradict the very words of the Constitution. The United States Constitution is a contract that was signed by thirteen sovereign parties, creating a federal governing body that was not a party to that agreement. At the end of the four-page handwritten document are thirteen signature blocks, one for each of the states. There is no signature block for the federal government. The concept of the “Living Constitution” implies that the written words of the Constitution are an outdated framework from which new and novel concepts and rules can be implied and approved. A common argument is that, because the internet didn’t exist and was even inconceivable when the Constitution was written, laws governing internet usage that contradict the First Amendment are acceptable. If you think that argument is logical, try to convince your mortgage holder that you can change the terms of your contract without his approval. The “Living Constitution” theory is a subterfuge created by those whose primary goal is to circumvent Article I, Section 8 (the Enumerated Powers) to increase the authority of the federal government and to limit and eliminate our individual freedom and Natural Law Rights. In legal terms, the words of the Constitution speak eloquently for themselves and are the written basis for our constitutional republic. This concept is no different than any contract written, agreed to, and signed today which binds the parties to a set of rules and actions that cannot be unilaterally modified, altered, or eliminated. With Congress politicized, polarized, and ideologically split, it is unlikely that useful or controversial legislation can be passed and signed into law. 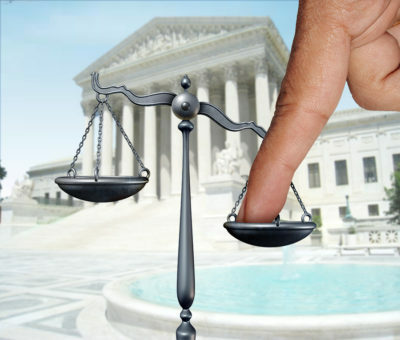 Moreover, once enacted, legislation is often challenged by legal action in the federal courts whose judges eventually decide which actually become law. Frustrated presidents then write executive orders that also meet the same fate. And, of course, bureaucrats write rules and regulations that can be upheld or reversed by federal judges if law suits are initiated by interested parties. The Supreme Court and the Federal Court System has become the third legislative branch and the executive branch combined and rolled into one. The “advise and consent” process for justices is conducted by a political body whose members vote to advance their ideological agenda. Supreme Court decisions override all other federal authority, which gives them, in essence, the same or, in some cases, more executive power than the president. Unfortunately, the sovereignty and fate of each individual is no longer within his own reach and grasp. Redress for grievances lies somewhere within the massive governing oligarchy that cares only for its own expansion and profit. The only public access is through the legal system whose door can only be opened with enormous sums of money. Since the “watchdog” function of the federal court system must be activated by lawsuit, only parties with deep pockets and abundant patience get their day in court. As the size of the federal government grows, political power is increasingly vested in the hands of federal employees who are unelected, unimpeachable, and untouchable by We the People. In the 1770s, it was taxation without representation that sparked a revolution. Now, legislation by the legal profession without representation could lead to a similar outcome. Collectivism vs. Individualism . . . Our Constitution protects and secures the latter, while the Left is intent on destroying its written words and everything it stands for. A related post, Why the Collectivist Left is So Angry, deals with the use of the Supreme Court for the past 100 years to advance the globalist elitist collectivist agenda. In this interview, Dr. Dan and Bob will discuss the importance and function of the Supreme Court of the United States. Part one of this four-part interview begins this weekend, Saturday and Sunday, December 8-9, on WJRB 95.1 FM and streamed live over the Internet. Part two airs Saturday and Sunday, December 15-16, part three airs Saturday and Sunday, December 22-23, and part four airs Saturday and Sunday, December 29-30. All programs are available by podcast following air time here. Bob Levy joined Cato as senior fellow in constitutional studies in 1997 after 25 years in business. In 1966, Levy founded CDA Investment Technologies, a major provider of investment information and software and served as CEO until 1991. He then attended George Mason School of Law, where he was chief articles editor of the law review and class valedictorian. Levy received his JD in 1994. The next two years he clerked for Judge Royce C. Lamberth on the U.S. District Court in Washington, D.C., and for Judge Douglas H. Ginsburg on the U.S. Court of Appeals for the D.C. Circuit. From 1997 until 2004 Levy was an adjunct professor of law at Georgetown University. His writing has appeared in the New York Times, Wall Street Journal, USA Today, Washington Post, National Review, and many other publications. Levy has also discussed public policy on national radio and TV programs, including ABC’s Nightline, Fox’s The O’Reilly Factor, PBS’s Newshour, and NBC’s Today Show. His latest book is The Dirty Dozen: How 12 Supreme Court Cases Radically Expanded Government and Eroded Freedom. Levy served as co-counsel in District of Columbia v. Heller, the successful Supreme Court challenge to Washington, D.C.’s, gun ban. In our counter operations in our area as we work against the negative social and political trends, we have encountered many instances where our courts, local and state work against the benefit of the people in general and in fact work to undermine the intents and affirmative truths of law. Our WA state supreme court us an obvious co-conspirator with the gun control and environmental agendas. Thus we have been forced to employ other methods of action that force the local and state agencies to simply do what is right. Our recent success in preventing the Hydro One/Avista merger is a critical victory. It is however not over as the 5 state utility will most likely try to injunction the decision and use the ever moving lines of reason and morality in our courts to supersede the law. Courts are being used daily now to destroy our Republic. I just read your December 8 Freedom Forum column–very good! The concept of a “living Constitution” is a bald-faced lie. Great stuff! However, let’s not forget that the Collectivist-“right” has also done little to nothing over the last 100 years to restore Neo-Amerika’s Civil Law to again honor and uphold our individual Natural Rights. Sure, Republicans often talk a great game going lip service to the concepts of liberty and a limited government, as outlined by the US Constitution. However, in practice they typically adopt Collectivist ideals while blaming the so called political “left” for our social ills, which truly makes them hypocritical. For example, currently the only thing that stands in the way of Permit-less Concealed Carry in NC… are Republicans! According to Grassroots NC, until January the NC Senate Republicans have enough numbers to pass with a veto-proof majority HB-746 to restore in our Civil Law one more aspect of our Creator-given individual and unalienable Natural Right of Self-Defense — to carry a concealed firearm. If these Republicans do not act now, they will have entirely disrespected those NC voters who put them into office to both protect what few Natural Rights are still being protected that the corrupt STATE (at all levels) has violated/usurped. The other tragedy will be that Americans will ignore the TRUTH and continue believing the lie — that Republicans actually give a damn about preserving/restoring our Natural Rights. Such is yet another tiny example of how this nation people still call “America” fell by the end of the “Civil War” with the passage of the 14th Amendment and the creation of an entirely new and different centralized and all powerful Federal government. Nearly every legislative, executive, and judicial action since has exemplified violations and usurpations of that which the STATE was supposed to protect. Bernard. Your comments are unfortunately correct. When you have a ruling class made up of career politicians, their actions only serve their own interests and not those of the people. We have been betrayed by the Republican establishment too many times in local, state, and federal jurisdictions not to realize that they are merely “slow” globalists-collectivists compared to the “fast” variety. If you haven’t done so, I suggest you read “Why the Collectivist Left is So Angry” and “The War of Coastal Aggression” on my website. Another great article for you would be “The Economy Does Not Care Who Won the Midterm Elections” by Brandon Smith on Alt-market.com in which he opines that global socialism is the common goal of both parties. The fault is the career politician and the two-party system rigged to perpetuate what amounts to “one party” rule. We are just pawns on the chessboard of Oligarchy. Pawns, however, can take down a King or Queen if they figure out the right moves. That’s the lesson for us.